The MailChimp integration gives you the possibility to easily sync all your customers to Retently, and automatically import new contacts. But the real power of the integration lays in the ability to segment your MailChimp audience and assign it to NPS campaigns. Follow the tutorial below to learn how to set up the integration. Custom segments created in Retently using MailChimp properties. Next sync: If you activate the auto-sync for a list or segment, you will be able to see when the next sync occurs. Menu: Clicking on the arrow icon next to the Sync now button will open the Segment menu with an option to activate the auto-sync, which will update your customers automatically. In the menu, you can also access the segment’s settings, or choose to delete a custom segment. Create a new segment button: Create a new custom segment, using properties from MailChimp, and applying additional filters. Menu button: By clicking on the arrow icon next to the Refresh data button, you will open the menu, which allows you to access the integration Settings page, and disconnect the integration. NOTE: The integration will display up to 50 MailChimp lists and up to 50 segments per list. Here, you can adjust the integration settings, which will apply to all your lists and segments. Overwrite contact data in Retently: Choose what customer data shall be overwritten in Retently based on data updates in MailChimp. When a customer is deleted in MailChimp: Decide what should Retently do with a customer if deleted in MailChimp. When a customer is unsubscribed in MailChimp: Decide what should Retently do with a customer once unsubscribed from MailChimp messages. You can access the Settings page from the menu next to each segment’s Sync now button on the main integration page. Your contacts have a list of properties in MailChimp, such as name, email address, country etc. Retently will map some of these properties automatically, whilst others will have to be mapped manually. 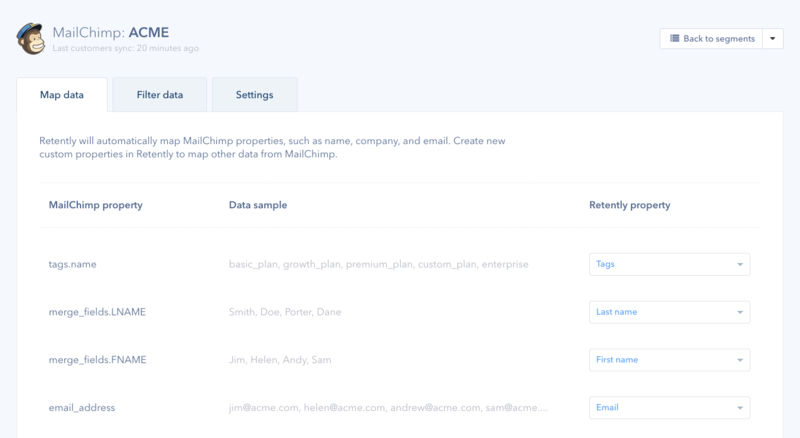 If you have a property in MailChimp that is not listed in Retently’s default list, for instance: “Signup date”, you can create a custom property and map it to the existing one in MailChimp. Mapping a property means that you select it to be imported to Retently and applied to customers. Mapping also helps our system understand what is this property, and how should it be named in your account. You will be using these properties when creating custom MailChimp segments, or when filtering the audience for your NPS campaigns. Once you have mapped customer properties and helped Retently understand what they are, you can create additional filters and decide what contacts will match this segment or list that you are currently configuring. If you don’t create additional filters, then all your contacts from this list or segment will be synced with Retently, together with the mapped properties. On this tab, you can decide how duplicates are handled by Retently. We recommend keeping the Update option, which will make sure that your customer data is synced between MailChimp and Retently. You can also apply a custom tag to your clients so that, at a later stage, to be able to filter your customers or NPS data. Another option gives you the possibility to decide if a customer that was previously deleted from Retently should be added during the next segment sync or not. To create a custom segment, you have to click on the + Create new segment button on your main integration page. A pop-up will ask you to give the segment a name (which you can rename later if needed) and choose what main list should be used as the source of your contacts. Defining the contacts source is important because each segment is created based on the customers and properties from a specific main list. Next, you will be asked to configure the new custom segment, which means to map the properties, create additional filters, and adjust the segment settings. Basically, all the steps that we have covered in the previous chapter, “Lists and segments settings page”. You can sync lists and segments, individually, from the main integration page. This can be done automatically, by clicking on the Sync now button, or you can activate the auto-sync option and let Retently sync them automatically, on a regular basis. 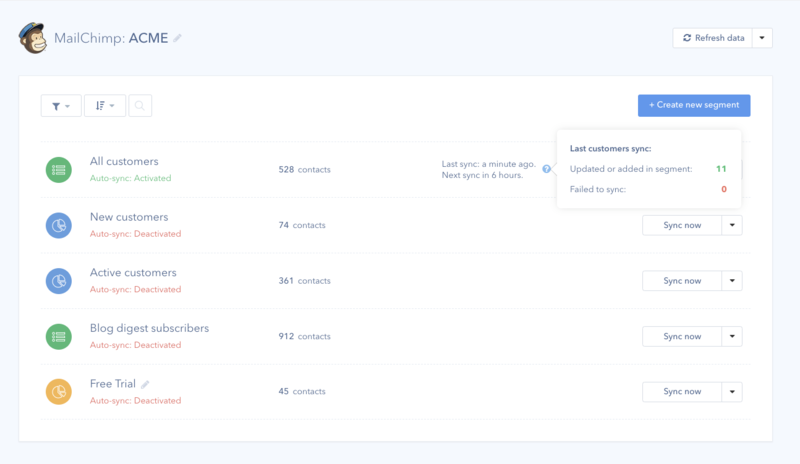 You can have the auto-sync activated for a specific number of segments, which is proportional to the number of NPS campaigns you can create in your account. When you try to sync a list for the first time, you will be given two options: to continue the sync with the default properties mapped automatically, or you can choose to map data and select what properties will be imported to Retently (this option is highly recommended). After you have synced your contacts, you can create an NPS campaign, or access an existing one, and go to the Audience section to choose the customers that will be surveyed in the campaign. All the data that you have mapped before syncing a list or segment will be available in the properties menu. Next, choose an operator and set a value to establish a filter. You can also select the “MailChimp segment” property, which will give you the possibility to select one of the segments you have already synced. You can find more details about the campaign audience segmentation here https://help.retently.com/campaigns/improved-audience-segmentation.